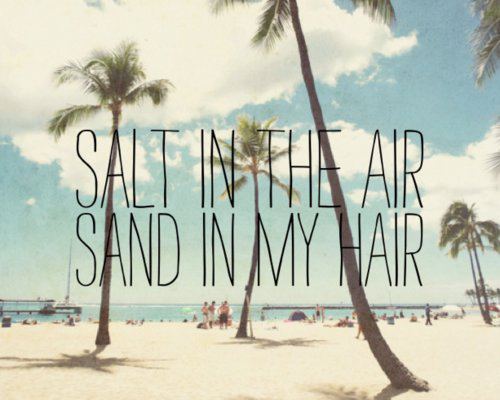 We’ve had enough of the April showers in our London design studio and to cheer ourselves up we have looking forward to the sun and getting in the Smiley summer holiday spirit. Our Hawaiian inspired tees and ocean blue prints will be hitting the stores very soon. We’ll keep you posted. 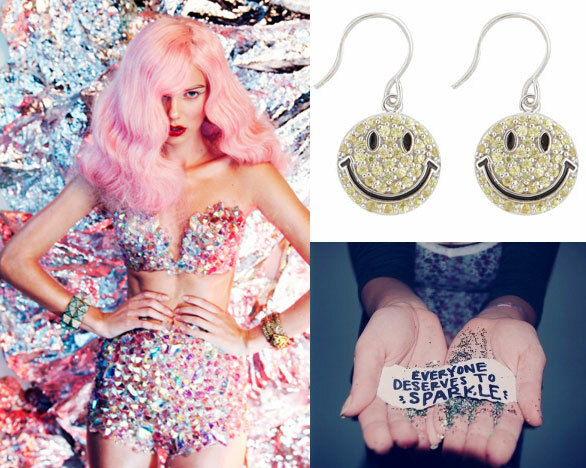 Sparkle stylishly this Spring with our playful earrings. Add some accent of luxurious happiness to simple outfits with these cheerful accessories available on our online store here. Our brand heritage dates back to Paris, 1979 when Franklin Loufrani founded the company. 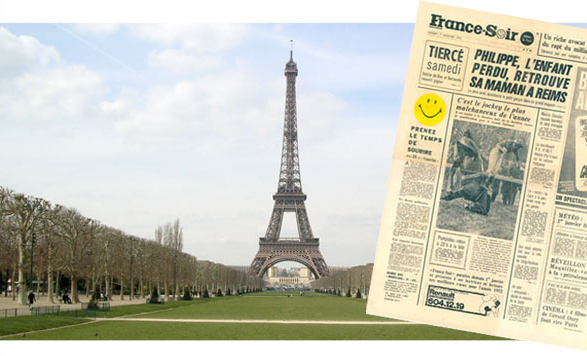 Franklin worked at a National newspaper in Paris and wanted to give his readers some positivity by highlighting all the good news stories with a Smiley logo. 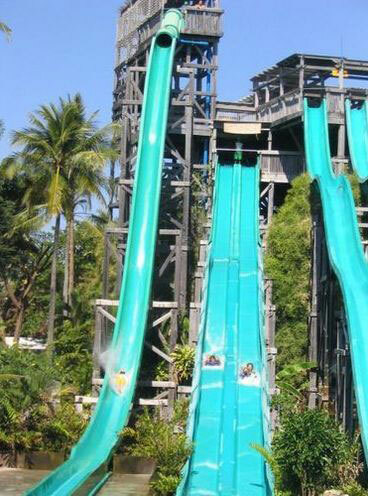 In a very short time Smiley became the most recognizable icon in the world and remains so to this day. The Smiley brand, began to reach global recognition as an ‘iconic’ logo with the rise of modernity, contemporary society and movements firmly establishing its heritage and identity in ‘Pop’ culture. 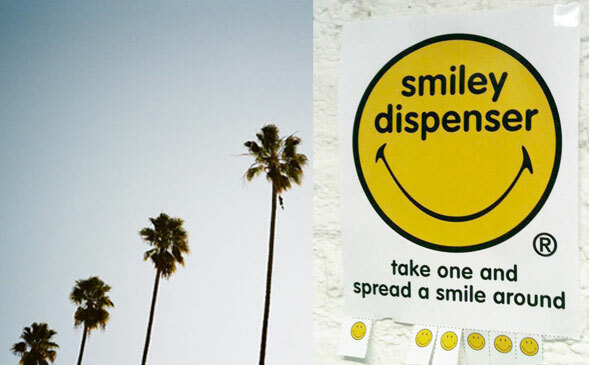 Through related shared beliefs and trends reflecting on popular social and design movements as well as musical evolutions since the early 1970s; Smiley was organically creating its own philosophy and meaning to people. During this decade the original smiley logo was used to represent the ‘summer of love’ emerging during the time of the infamous Woodstock festival. Used as the symbol of peace and love, it offered people a sense of freedom and happiness during a difficult time when the world was facing both political and economic uncertainly. The 1980’s saw the birth of the house music movement and the Smiley logo was once again used to represent this new musically pioneering time, allowing people a means of escape during enduring politically repressed time; no more so than in the UK. 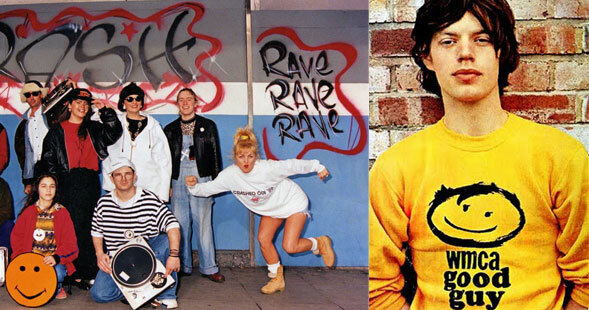 Acid house and rave fans used the yellow Smiley face symbol as an emblem of the lifestyle behind the music. Heavily linked with the famous Hacienda nightclub in Manchester (home to the acid house movement, DJs and musical artists during this period), some to this day still consider Smiley a sacred symbol of this liberating time. In the 1990s the original smiley logo was omnipresent during the explosion of grunge rock music when it was used by notorious Seattle rockers Nirvana as a symbol of self-expression and anti-establishment against the corporate world. 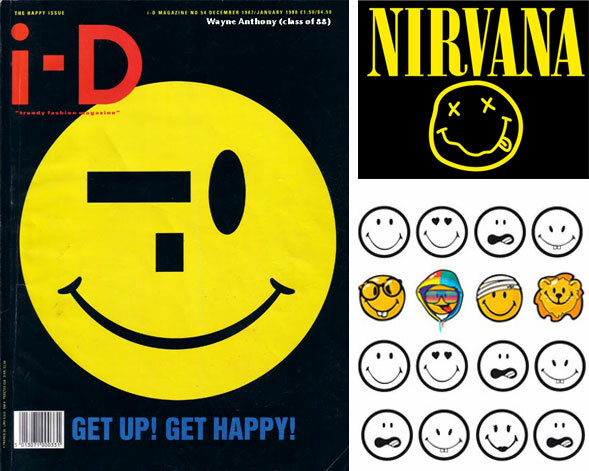 Pop culture, music and youth movements have always used the smiley logo as a symbol of expression. It came as no surprise that as people lent more to technology to communicate with one another following the creation of the internet, that smiley was there from the start. The emoticons (a facial expression pictorially represented by punctuation and letters, usually to express a writer’s mood) where a revolutionary way to communicate expression visually where text remained limited. The first emoticon came in the form of a sideways image of Smiley 🙂 and was used on email for the first time by computer scientist Scott Fahlman in 1982 to enhance his text. As a result a whole dictionary of hundreds of emoticons made of punctuation started to spread across the world! 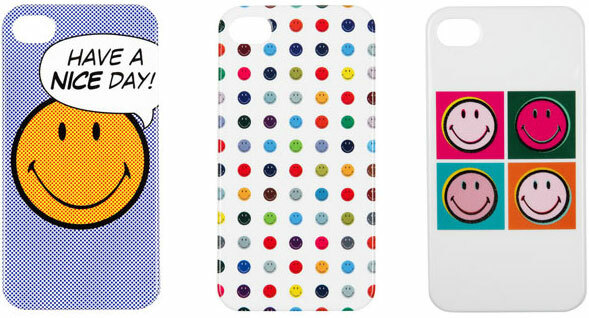 Personalise your IPhone 4 with these playfully stylish art inspired phone covers, available to buy etail store here. Enter our fantastic competition for a chance to win a Smiley Watch – we are giving one away every single day this month. To enter, simply share your pic, video or photo and tag Smiley in your facebook post using hashtag #smileyhappytime in your comment. 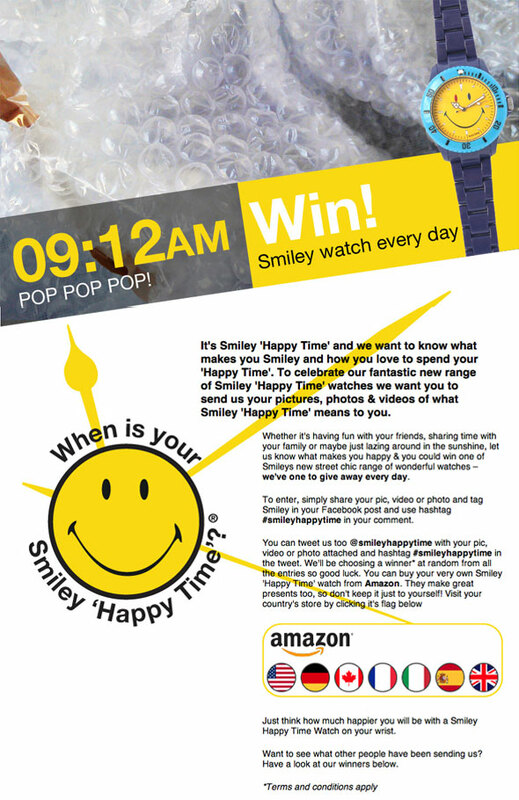 You can tweet us too @smileyhappytime with your pic, video or photo and tag #smileyhappytime in the tweet. We are choosing our winners daily at random so good luck! 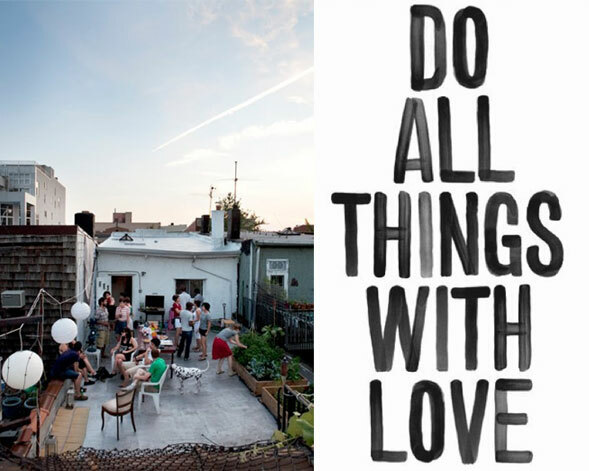 As Spring blossoms we look for positive growth and enjoy the simple pleasures of the home. 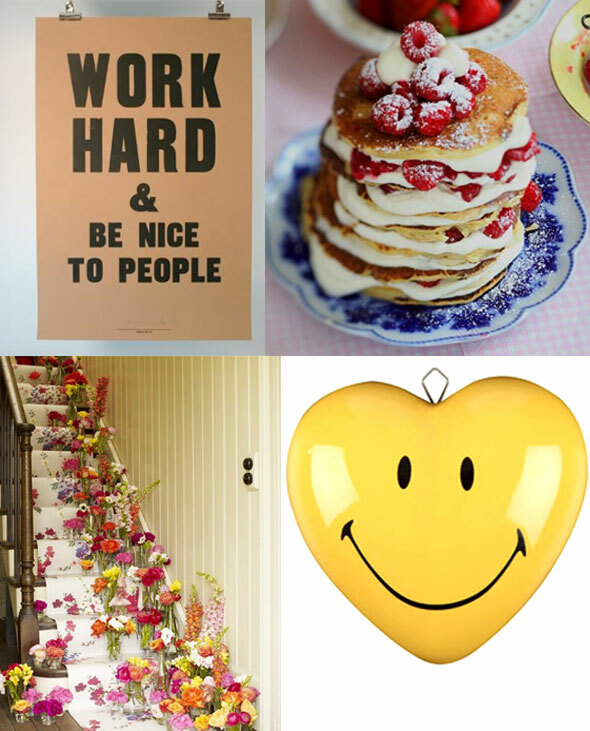 Add some Smiley deco to your home with our ceramic hearts available to purchase here.